In the hillside village of Masoalikuka in Malawi, Mary Biliati spends several days a week helping her neighbors overcome a common dilemma: How can we get our kids to eat their pumpkin leaves? Pumpkin leaves are an excellent source of iron, protein, calcium and vitamins A and C. The trick, says Mary, is making them tasty: Mix the leaves with some flour, egg, onion and tomato, form them into balls, fry them in a little oil, and you have a fritter that will leave kids asking for more. It's a simple strategy to address a vexing problem: child malnutrition in one of the least developed countries in the world. Mary is a parent volunteer with Catholic Relief Services' Brighter Futures project, which your support enables us to carry out with our partner, the Catholic Diocese of Dedza. Brighter Futures uses a holistic approach to help families of vulnerable children by providing preschool classes for children ages 2 to 5 and nutrition, health and sanitation education for their parents. Through Brighter Futures, Mary learned valuable lessons about nutrition. She can now grow and prepare more nutritious food using fortified flour and, to add variety to her family's diet, combine the flour with ingredients such as vegetables and eggs. "I used to cook for the children whatever we had," Mary says. "Now, I know how to combine things in a certain way, and the food will be more nutritious, better for the children." She's passing on this knowledge, taking the lessons to other villagers' homes two or three days each week. There, she also teaches the importance of hand-washing to prevent the spread of disease. The center of activity in the village, though, is the mud-brick building with the sheet metal roof that houses the community-based child care center. About two dozen children sit on the floor while one of their teachers leads them in an English lesson, singing a song about the days of the week. In addition to providing early childhood education, the center gives parents a few precious free hours to get some work done at home or in the field. The school is run by four teachers. Assisting them is a parents' committee, which coordinates supervision for the children, cooks a hot meal for them each day and provides the educational programs in nutrition and hygiene for other parents. Before the child care center opened, young children didn't receive any formal education until they attended a primary school some distance from the village. Mary currently has two children at the child care center. She knows her 5-year-old son, Maogoastors, will be much better prepared than his older sisters were. "He will be going to primary school knowing the alphabet, knowing how to write his name, knowing his numbers. His sisters didn't know how to write their names," she says. "It makes a difference." Her husband, Frank, believes this head start on his children's education will bring them a better future. 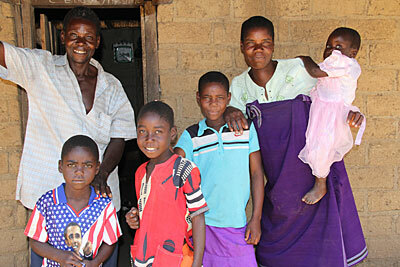 Most children in the village don't go beyond primary school, but he hopes his children might aim higher. "They will have a better chance to complete school and get a good job," he says. And because parents are so involved in the child care center and its affiliated programs, Brighter Futures has had an added benefit to the village. "It's brought the community closer," Frank says. "The whole community works together."